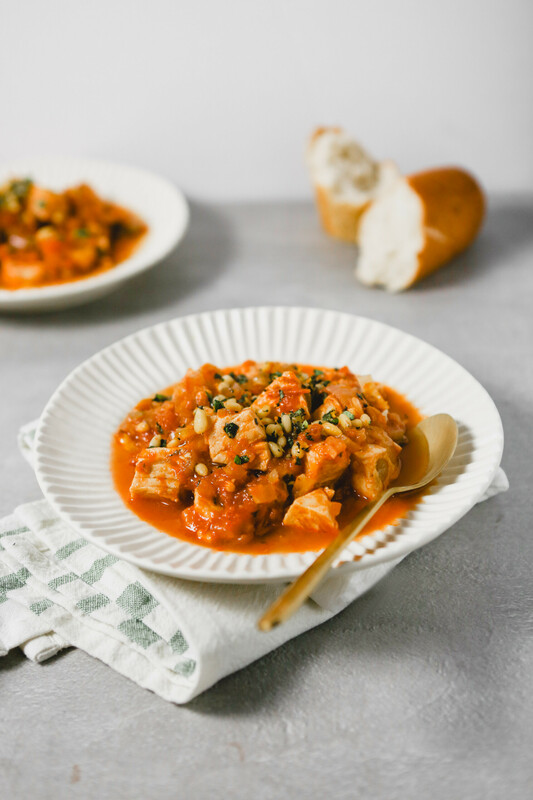 This cozy Sicilian Fish Stew is the perfect hearty dinner for the holidays. 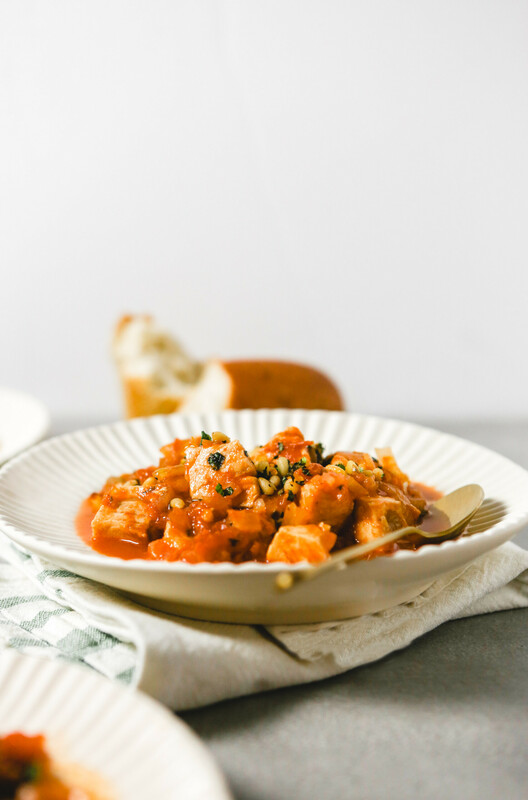 With a variety of Sicilian flavors and a touch of Arabic influence, this stew strikes the perfect balance between sweet, salty and sour. In celebration of ZK’s Annual Cookbook Gift Guide (coming very soon! ), I’m sharing one of my favorite new recipes from America’s Test Kitchen’s new cookbook, “Cook It in Your Dutch Oven ” Spoiler alert, this book is featured in my gift guide. Not only that, I’ll be giving away a copy of this book, packed with foolproof recipes that are both weeknight friendly and weekend projects, to one lucky follower! If you’re interested in entering for a chance to win, be sure to follow ZK on Instagram for giveaway updates. OK, back to this Sicilian Stew. 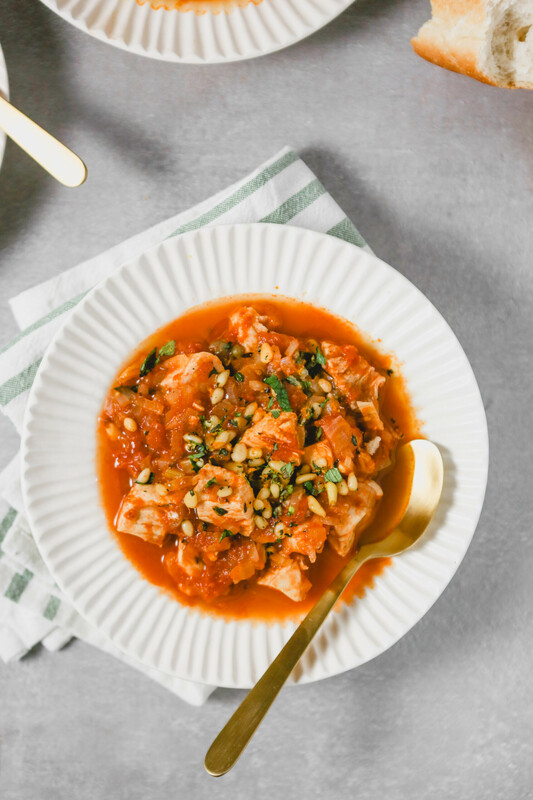 I decided to feature this elegant, tomato-based fish stew in this year’s Christmas Menu as a very loose homage to the traditional holiday meal, Dinner of the Seven Fishes. Emphasis on loose. But a stew this packed with flavor and texture is really all you need to be happily satisfied. But add a fresh Shaved Fennel Salad and a chunk of bread and you’re set. Truly, it’s all you need, plus it’s elegant to boot. What goes with fish stew? I’ve prepared a complete menu to answer just this question! You can mix and match and create a menu that’s as big or as small as you’d like. 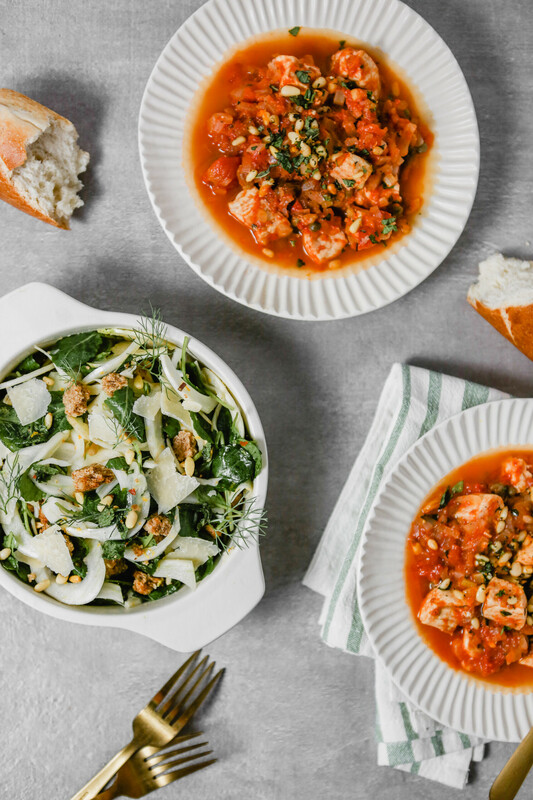 The most streamlined menu includes the Shaved Fennel Salad, baguette, Sicilian Fish Stew and a good bottle of wine. How long does fish stew keep? 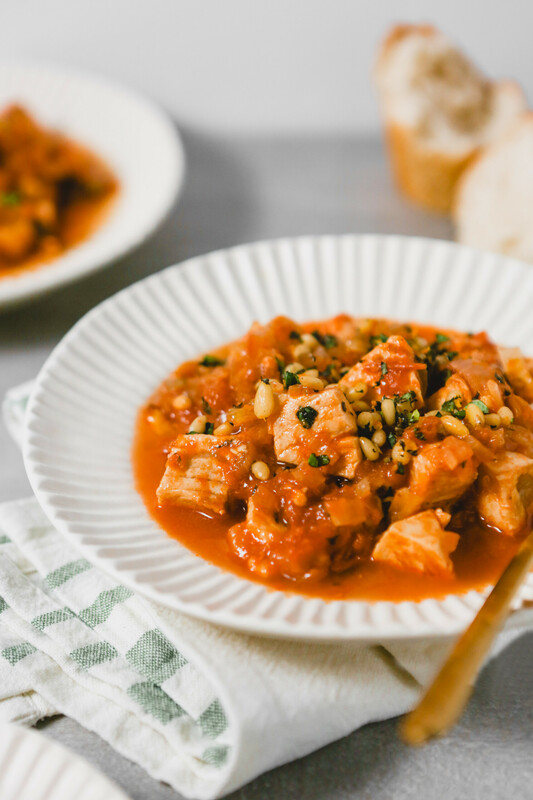 If you have leftovers, fish stew can last up to 2 days in an airtight container in the refrigerator. I do not recommend freezing fish stew. How to reheat fish stew. Reheat fish stew either on the stovetop over low heat or reheat individual bowls in the microwave for 2 minutes on high. 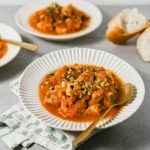 What’s the best kind of fish to use in fish stew? The challenge then, with any type of fish, lies in not overcooking it and not breaking it up into small pieces. 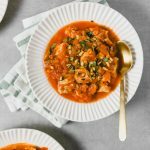 To combat the repetitive tale of overcooked fish, ATK decided to add 1-inch chunks of fish to the stew towards the very end of cooking. This recipe calls for partially cooking the fish in the simmering stew, then letting it finish cooking via residual heat from the covered Dutch oven. Perfectly cooked fish. Every. Single. Time. Plus, when tender swordfish is served in a tomato broth laced with raisins, capers, wine and clam juice, you know it’s got to be good. Like I say with a lot of things, not all fish stews are created equal. But this particular fish stew is definitely on the healthier side. There’s little added fat (of which is heart healthy) and the flavorful broth is made from minced vegetables and tomatoes. What’s more, the swordfish adds lean protein, making this meal healthy and satisfying. 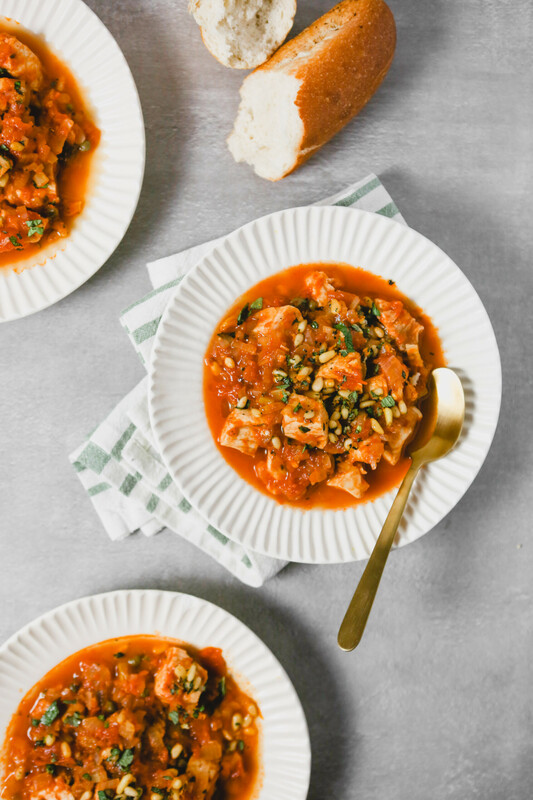 This cozy Sicilian Fish Stew is the perfect hearty dinner for the holidays. 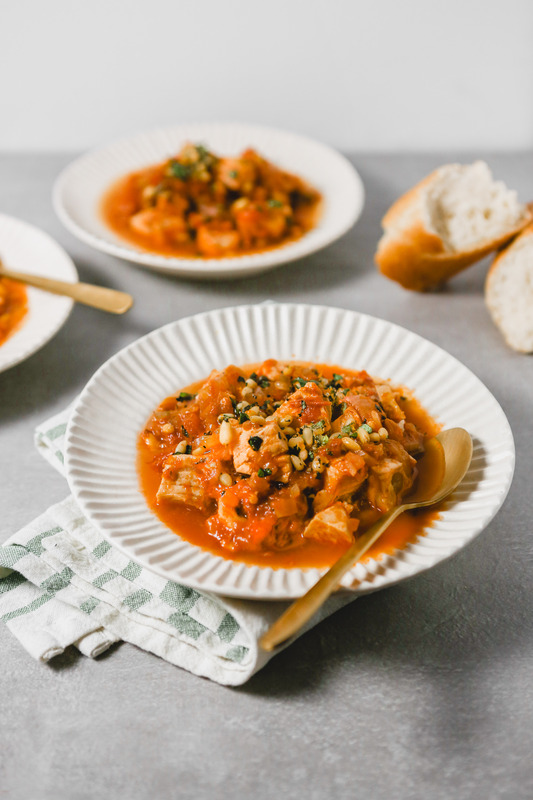 With a variety of Sicilian flavors and a touch of Arabic influence, this stew strikes the perfect balance between sweet, salty and sour. 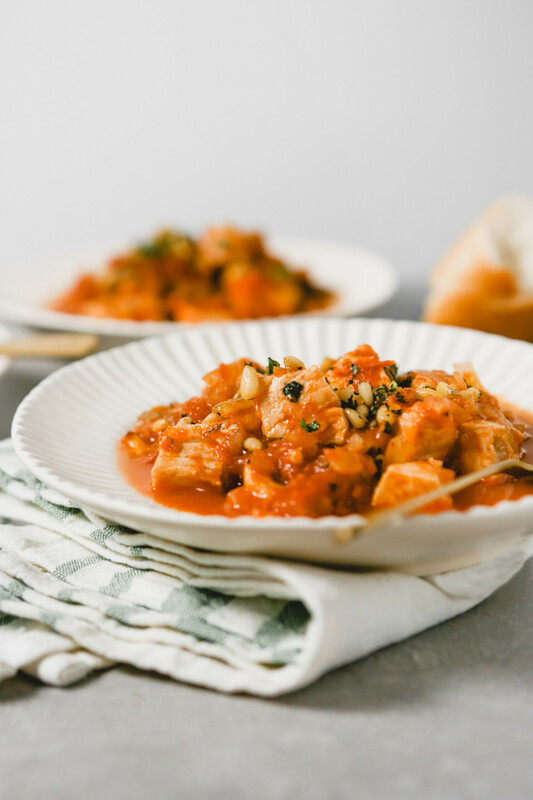 Featuring an aromatic tomato broth, tender swordfish, raisins, and capers, this is one flavor-packed stew. Combine pine nuts, mint, one-quarter of garlic, and orange zest in bowl; set aside for serving. Heat oil in Dutch oven over medium heat until shimmering. Add onions, celery, ½ teaspoon salt, and ¼ teaspoon pepper and cook until vegetables are softened, about 5 minutes. Stir in thyme, pepper flakes, and remaining garlic and cook until fragrant, about 30 seconds. Stir in wine and reserved tomato juice, bring to simmer, and cook until reduced by half, about 4 minutes. Stir in tomatoes, clam juice, raisins, and capers, return to simmer, and cook until flavors meld, about 15 minutes. Season swordfish with salt and pepper. Add swordfish to pot and spoon some cooking liquid over top. Bring to simmer and cook for 4 minutes. Off heat, cover and let sit until swordfish flakes apart when gently prodded with paring knife, about 3 minutes. Season with salt and pepper to taste. Serve, sprinkling individual bowls with pine nut mixture.